My Farm to School Friends... this week is apple week here at Jefferson. 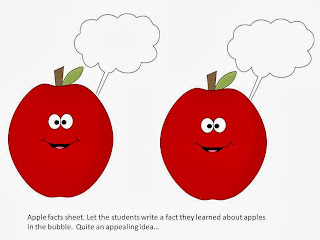 Our kiddos are learning about apples by doing different science activities. We counted the number of seeds in different types of apples and read an apple book. We also made an apple art project and made a graph of our favorite type of apple. We have an apple farmer coming into our after school program to share facts about apples and what he does for a living, and he is bringing apples to serve in our cafeteria. Here is a sheet that our kids used to make a bulletin board for our lunch room. Have at it.